Engine Timing Belt Kit with Water Pump-Water Pump Kit w/o Seals fits 96-04 RL. Marketing Description - 2000 : Dayco(R) Timing Belt Water Pump Kits are manufactured to meet the critical OE quality fit, form and function requirements demanded by both domestic and imported vehicle manufacturers to ensure long lasting peak performance. Country of Origin (Primary) : CN. Harmonized Tariff Code (Schedule B) : 8413309000. Interchange Part Number : TCKWP279, PP279-280LK1, TB279-280LK1, CK279-280LK1. Life Cycle Status Code : 2. Other Part Number : WP279K1A, WPK43133, GTKWP279. 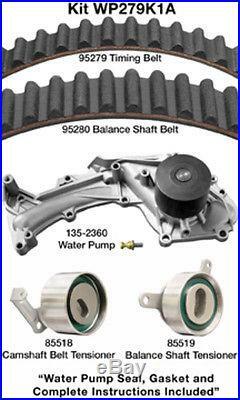 Product Description - Long - 80 : Timing Belt Water Pump Kits. Product Description - Short - 20 : WATER PUMP KIT. See Item Specifics section for additional specifications about this part. To confirm that this part fits your vehicle, enter your vehicle's Year, Make, Model, Trim and Engine in the Compatibility Table. Also review the notes section in the compatibility chart for additional specifications about this part. This part generally fits Acura vehicles and includes models such as RL with the trims of Base Sedan 4-Door, Premium Sedan 4-Door, SE Sedan 4-Door. The engine types may include 3.5L 3475CC V6 GAS SOHC Naturally Aspirated. This part fits vehicles made in the following years 1996, 1997, 1998, 1999, 2000, 2001, 2002, 2003, 2004. This item may interchange to the following part numbers from other brands. Brands: ACDELCO, AUTOZONE/CRP, AUTOZONE/DAYCO, CARQUEST, CARQUEST/GATES, CONTINENTAL ELITE, CONTITECH, CRP, CRP CANADA, CRP/CONTITECH (INCHES), CRP/CONTITECH (METRIC-FULL), CRP/CONTITECH (METRIC-IMPORT), GATES, GATES CANADA, NAPA, STANT Part Numbers: CK279-280LK1, GTKWP279, PP279-280LK1, TB279-280LK1, TCKWP279, WP279K1A, WPK43133. Outstanding Customer Service That Will Make Sure You Get The Parts You Need. Your satisfaction is important to us and we value your business. Portions of the part information on this page have been provided by WHI Solutions, Inc. The item "Engine Timing Belt Kit with Water Pump-Water Pump Kit witho Seals fits 96-04 RL" is in sale since Monday, September 26, 2016. This item is in the category "eBay Motors\Parts & Accessories\Car & Truck Parts\Engines & Components\Timing Components". The seller is "superstoreworld" and is located in Rockville Centre, New York.